Home » Aviation » Amelia: A Look Back at the Pioneering Aviator. A publication-quality photograph is available at ftp://ftp.purdue.edu/pub/uns/earhart.newdocs/earhart.electra.jpeg. On July 2, 1937, Amelia Earhart, in an attempt to circumnavigate the globe, disappeared mysteriously into the expanse of the Pacific Ocean. Somewhere en route from Lae, Papua New Guinea, and Howland Island, she and her navigator, Fred Noonan, lost communications with those on the ground. The circumstances surrounding her disappearance have been the subject of years of speculation and fruitless efforts to determine Earhart and Noonan’s fate. Numerous theories, from sensational rumors, claiming Earhart was a spy for the US government or even she was working for the Japanese government, to more technical speculation, such as the crash-and-sink theory or that she landed on a different island, continue to fuel curiosity. However, the story of Amelia Earhart did not begin with her disappearance. Quite on the contrary, she was a remarkable woman who made a name for herself in the male-dominated world of aviation. These experiences and opportunities instilled in Amelia a sense of adventure and a willingness to break out of societal norms. However, she was not immediately drawn to aviation. Her first airplane sighting came at age ten at the Iowa State Fair, but she ultimately was not impressed with the experience, saying the plane was “a thing of rusty wire and wood and not at all interesting”. Though she did not pursue aviation as a career until much later, Amelia developed a love of science and math, excelling at these subjects in school, despite pressure to conform. She even kept a scrapbook detailing the accomplishments of women in male-dominated fields, such as mechanical engineering, law, management, and advertising. Her academic career took a short detour in 1918 when she spent a brief time volunteering as a nurse at a hospital in Toronto, caring for patients during the Spanish flu pandemic. This experience, though short in time, maintained a connection to the aviation world. Many of her patients were French and British pilots, and soon after beginning, she and her sister spent time at the nearby airfield watching the pilots in the Royal Flying Corps train. She soon returned to the United States, with the intention to enroll at Columbia University and pursue a career in medicine. Which did not last long. She soon left Columbia to be with her parents in California and had she not, we may not know her as Amelia Earhart, pioneering aviator. In 1920, Amelia and her father visited an airfield in Long Beach, California. There, she met aviator Frank Hawks, who agreed to take her on a short flight. In that short ten-minute flight, she knew her calling. Realizing she needed a way to pay so she could pursue her dream, Amelia took a number of odd jobs, including working as a stenographer for a telephone company. Finally, in 1921, she began lessons with Anita “Neta” Snook, another pioneering aviator, who agreed to take her on. Within six short months, she saved up enough to purchase her first plane, a bright yellow Kinner Airster, which she affectionately nicknamed “The Canary”. It wasn’t long after that that Amelia set her first record and began making a name for herself in the aviation world. By 1922, she made a solo flight to 14,000ft, a first for a female pilot. Not long after, she became the 16th woman to obtain a pilot’s license. Despite showing promise in the field, she once again had to give up her ambitions, temporarily. During the 1918 Spanish flu pandemic, Amelia herself was a victim of the infection. Because of this, she suffered from chronic pain in her sinuses, which continued to plague her. Troubles in her family also forced her to reconsider her choices. After re-enrolling at Columbia in the fall of 1924 to continue her medical studies, Amelia later left to join her mother and sister in Boston. Wanting to study there, at MIT, she once again found herself unable to continue. Money was tight for the family, and the tuition costs were too steep to allow Amelia to study. Instead, she took a job as a social worker at Denison House in Boston. Though she was not actively flying, she fiercely held onto her love of aviation. 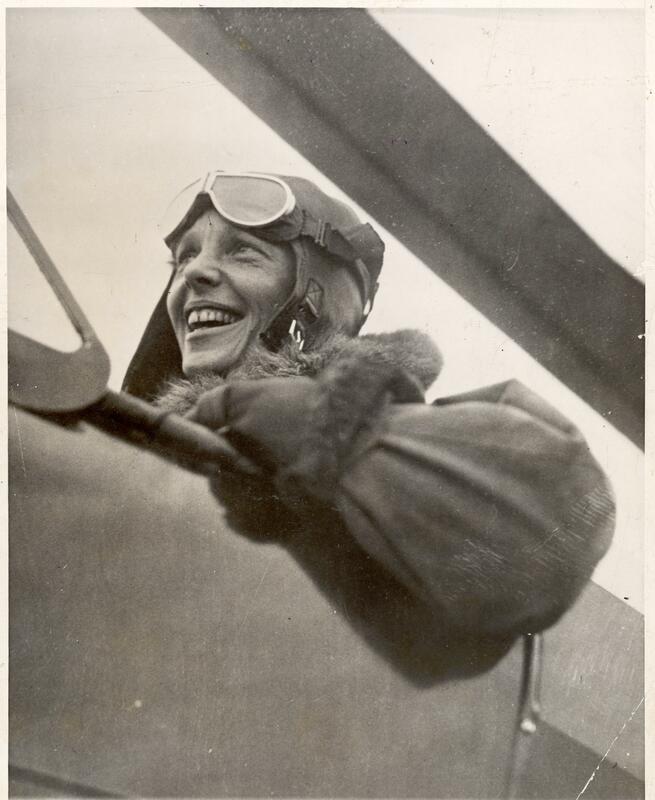 During her time in Boston, she actively worked to promote aviation, specifically advocating for women in aviation. Her passion drove her to form an organization for female fliers. This dedication and work kept her name circulating in the aviation world, though she wasn’t actively flying. And that work eventually paid off. In 1927, Charles Lindbergh made the world’s first nonstop solo transatlantic flight. With this, a frenzy began. Pilots began to line up, looking to complete the journey themselves, and push the boundaries of air travel even further. One such person was Amy Guest, a multi-billionaire, who wanted to be the first woman to be flown across the Atlantic. However, her hopes were dashed when she and her family determined the journey to be too perilous for her to undergo. Luckily for our heroine, Amelia, Amy Guest was determined to find another woman to take her place. But that flight nearly never happened, because of Amelia’s stubbornness. One day while working at Denison House, a call came for her. She initially dismissed the call, saying she was too busy. However, on the other end of the line was Captain Hilton Railey, asking if she wanted to be the first woman to cross the Atlantic by plane. Initially skeptical of this offer, she later came to realize Railey was genuine and this would be the opportunity of a lifetime. Though she would not be flying the plane herself, it was this flight that restarted Amelia’s aviation career, a path that she did not stray from for the remainder of her life. On June 17, 1928, Amelia Earhart, along with pilot Wilmer Stultz and copilot Louis Gordon, set off from Trepassey Harbor, Newfoundland in a Fokker F.VIIb, nicknamed “Friendship”. About 21 hours later, the crew landed in Pwll, South Wales to a rousing welcome. Though she was, in her own words, “just baggage, like a sack of potatoes,” she was inspired by her experience. She wanted more. She would not fade into oblivion. Amelia’s transatlantic flight gave a public face to women in aviation. Her celebrity status was cemented, with the media nicknaming her “Lady Lindy”, a reference to her likeness to Charles Lindbergh, and “Queen of the Air”. Endorsements, product lines, lectures, all in the name of a female face of aviation. This dizzying swirl of attention did not sway Amelia. Instead of resting on her laurels, she continued to push her boundaries and continued to help promote women in aviation. The endorsements were simply a means to keep funding her passions, even taking a position with Cosmopolitan magazine in an effort to bring aviation to the attention of a wider audience, particularly highlighting the accomplishments of women in the field. Her involvement also stemmed to an association of female aviators, called The Ninety-Nines, named for the 99 women who expressed interest in forming a group for the purpose of advancing and supporting the careers of women in aviation. When not touring and posing for endorsement photos, Amelia was hard at work solidifying her legacy as an aviator in her own right. She already held the title of “First Woman to Cross the Atlantic”, with the footnote of being a passenger. She wanted a title of her own. In the months following her Atlantic travels, Amelia gained her first title: First Woman to Solo Across the North American Continent and Back. She also took up competitive flying, participating in a number of air derby events. She continued to set records, including an altitude record for an autogyro, reaching 18,415ft, a record that was left unchallenged for years. Still not satisfied, Amelia came back around to the idea of repeating her transatlantic flight. But this time, she would be in control. While continuing to hone her flying skills, Amelia and her husband, publisher and publicist George Putnam, began to lay the groundwork for her flight. 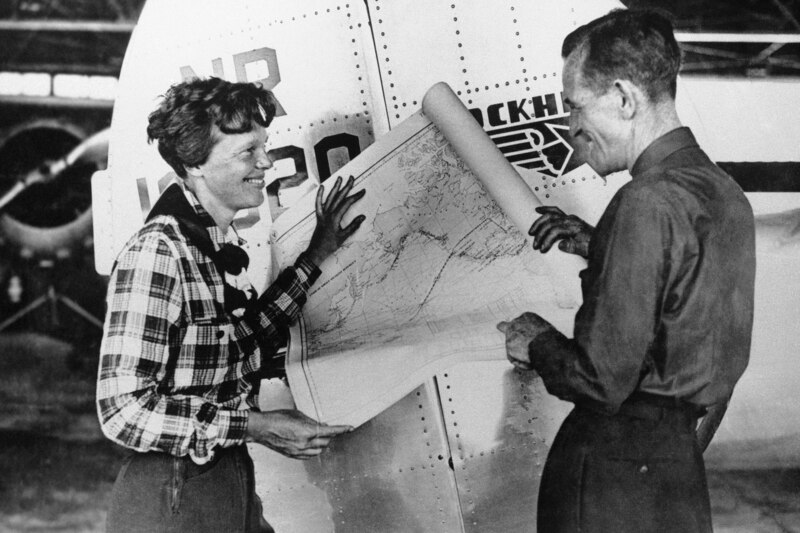 Putnam and Earhart had met previously when working together to coordinate her first transatlantic flight. Over the years, they had developed a close friendship, which wound up in matrimony on February 7, 1931. Their marriage, like Amelia’s upbringing, was extraordinarily unconventional at the time. Amelia was accustomed to her independence, and would certainly not have been satisfied to be forced into the box of 1930s housewife-dom. She believed that women were equal partners, both emotionally and financially, in a marriage, even rejecting the term “marriage”, favoring the word “partnership.” This sentiment extended to the public sphere. The New York Times, in articles written about Amelia, would insist on referring to her as “Mrs Putnam”, per the style guide for the time. When confronted with this, Amelia simply laughed off the matter. 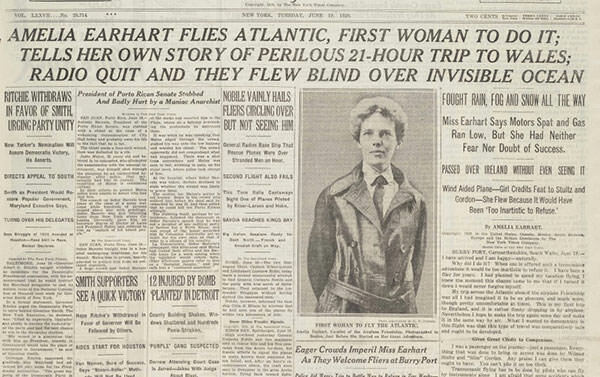 The roles even reversed, with Putnam eventually gaining the unofficial title of “Mr Earhart”, due to his wife’s immense popularity and international acclaim. Luckily, Putnam was a great supporter of Amelia, and happily shared her views on marriage. Such bending of gender roles was practically unheard of at the time. Having solidified support on the ground, Amelia pushed to greater heights. With the intent to fly from Harbor Grace, Newfoundland, to Paris, Amelia set out on May 20, 1932, exactly five years after Charles Lindbergh made his transatlantic journey. She set off, but it was not smooth sailing for the trip. Poor weather conditions, strong winds, and mechanical issues plagued her for nearly the entire duration of the flight. She was forced to land in Londonderry, Ireland, in a pasture which, “scared most of the cows in the neighborhood.” Though she did not make it to Paris as she had planned, she had successfully crossed the Atlantic in record time, 13 hours and 30 minutes, and news spread fast. The second person and first woman to fly solo across the Atlantic. She was honored for her accomplishment and was awarded the Distinguished Flying Cross by the US Congress, a first for a woman. She even gained a following on the other side of the Atlantic, touring the European continent, meeting with various heads of state, from the Prince of Wales to Belgian King and Queen, and even the Pope. She was rapidly becoming an international celebrity, an incredibly accomplished woman in a boy’s club. With this, Amelia knew she was unstoppable. Back stateside, she used her status to advocate for more women in the field and continued to smash records into oblivion. The same year she crossed the Atlantic solo, she made the fastest non-stop transcontinental flight as a female pilot, traveling from Los Angeles, California to Newark, New Jersey in 19 hours and 5 minutes. While that might seem like a long time to those of us more accustomed to the (dis)comforts of jet travel, this was an incredible feat for the early 1930s, when airplane travel was still in its infancy, and nothing was ever certain. And so, the story repeats: Amelia accomplishes an incredible feat, receives acclaim, and continues to push the boundaries of human flight. Rinse and repeat. Amelia’s ambition led her to aim higher and seek more. After her successful Pacific flight, Amelia set her sights on the ultimate prize: circumnavigate the globe. A number of pilots had already completed such flights, but Amelia wanted to attempt the longest route, by sticking as close to the Equator as possible. Planning for the flight began in 1936, first with the purchase of a plane, the Lockheed Electra 10E, dubbed the “flying laboratory”. The plane provided the means, but Amelia could not complete the journey alone. She initially had two navigators, Captain Harry Manning and Fred Noonan. However, for the official attempt, only Noonan accompanied Amelia. The first attempt of this historic flight was to be flown from west to east. The first leg was from Oakland, California to Honolulu, Hawaii, but the attempt was cut short. Unlike Amelia’s first Pacific crossing, this time was not so smooth sailing. Mechanical problems forced the crew to land at the US Naval Base in Pearl Harbor. Unfortunately, the aircraft was so badly damaged that the attempt had to be scrapped and the plane was sent back to the mainland US for repairs. Plans for the circumnavigational flight were reassessed, and it was then decided that the set of flights would instead be flown east to west, starting in Miami, Florida. 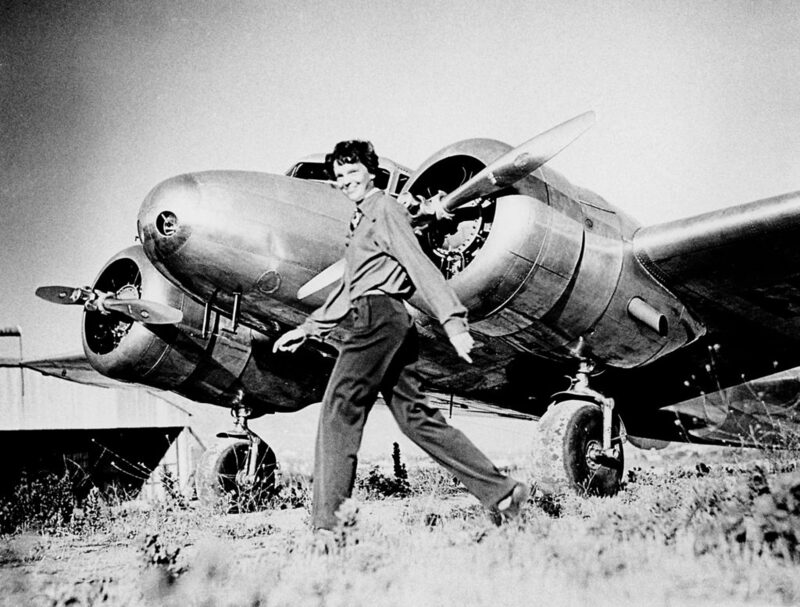 On 1 June 1937, Amelia Earhart boarded the Lockheed Electra, ready to take on the world. Along with Fred Noonan as her sole navigator, their flights took them to many locales, from Venezuela and Brazil to Senegal and Mali, Pakistan and India, Thailand, and Indonesia. Very little is known about these flights, unfortunately, nor was there much publicity in many of the cities where she landed. She gained local attention, but any written documentation is scarce, outside of airport notes indicating that she landed and took off to her next destination. Knowing that Amelia and Noonan made it to Papua New Guinea in just over a month after departing the United States, one can only assume that their travels were mostly smooth sailing. The few notes that are available from her travels show Amelia insisting that she was completing her round-the-world journey simply for fun. Until fate had her way. On 2 July 1937, Amelia Earhart boarded her Lockheed Electra for the last time.